The Minnesota State Fair is a local tradition for many. This annual festival is known for its decadent foods, usually deep-fried and served on a stick. Most of these foods are known not to be vegan, for example: cheese curds, deep-fried Twinkies, and corn dogs. For those of us who choose to only eat plant-based foods, what can we do? Do we avoid the fair altogether? No way! 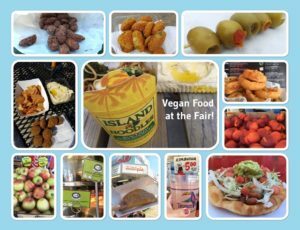 If the fair is something you enjoy, you can still enjoy it, finding plenty of awesome vegan offerings to satisfy your hunger along the way. And yes, some of these vegan offerings are even served deep-fried and on a stick. A couple years ago, we published a guide to vegan food at the fair. You can check that out, as much of it still applies, but this year we put out a call to all of our volunteers going to the fair and asked them to let us know what they could find. We got a number of beautiful photos and fun descriptions that we’ll share with you here. Take a look at the photo collage, read the descriptions, and bring this list with you when you go to the fair in the next few days. Falafel on a stick from Holy Land. The Tzatziki sauce is not vegan, but you can get a side of hummus instead, and that may come with pita chips. $6 plus $2 for hummus. A selection of beer and beer-battered onion rings at The Ball Park Cafe. The onion rings come out hot and fresh! Cinnamon Roasted Almonds are a perfect snack and available at the International Bazaar. There’s a coupon for them in the Blue Ribbon Bargain Book. Green Tea Slushie at Cloud Forest Coffee. They also have 4 different fruit flavor shots you can add for an extra 50 cents. The Indi Frites at Hot Indian Foods, located at the Midtown Global Market stall for the second half of the fair. Soba noodles from Island Noodles are quite flavorful and conveniently served in a to-go container. They are served with a ginger-garlic sauce and tons of veggies: broccoli, carrot, peas, green beans sweet potato, summer squash, red and green pepper! Find them at the International Bazaar. The Minneapple Pie is awesome, wonderfully flaky, sprinkled with cinnamon and sugar, and verified vegan. The Vegetarian Taco without cheese from OOf-da Tacos. Add guacamole for 50 cents. The fry bread is also vegan and especially good with hot sauce. Fresh fruit at Produce Exchange, where you can also get fresh Guava Kombucha on tap. They have two locations at different ends of the Fair. Pina colada from Orange Treet just outside the food building. Ask for it to be nondairy and they will make it without the dairy powder. Thanks to Kristina deMuth, Laura VanZandt, Brita Bengtson, Sheri Olson, and Katie Manthey for sharing these photos and food recommendations!